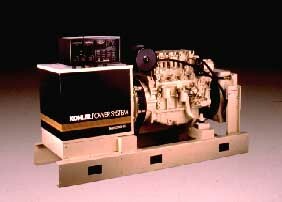 Kohler Co., Generator Division now offers the ROZK generator sets, ranging from 20 to 170 kW, to provide on-site power for standby, prime or energy management applications. Each of the 13 generator sets are powered by four-stroke EPA-certified Deutz diesel engines. Units in the 50 to 170 kW range feature electronic governing and engine controls to assure precise frequency regulation, voltage stability and generator management. Systems incorporate Kohler Co., Generator Division's brushless alternator technology. Relying on a patented activator recovery system, the permanent magnet-excited generators (PMG) are said to deliver good motor starting ability and provide instant response to load changes.